Galaxy density waves are lines of enhanced density of stars which propagate through the disc of a galaxy in the form of a spiral. 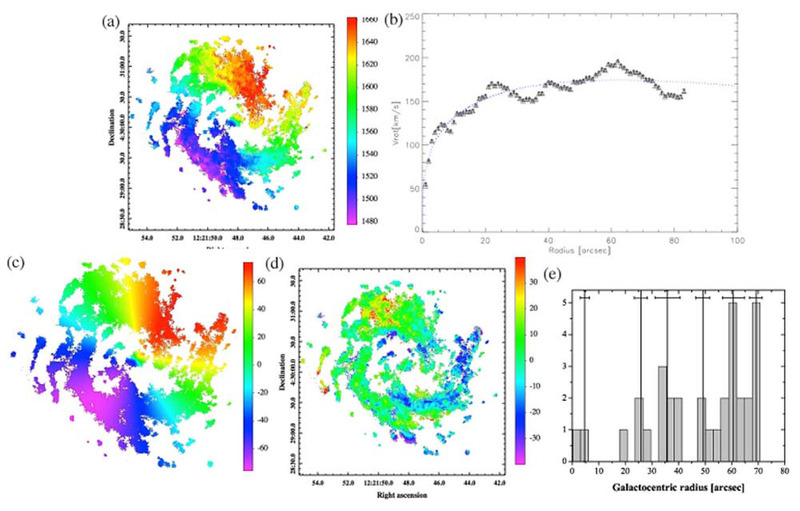 The theory of density waves offers an excellent framework for studying the spiral structure in galaxies as it provides quantitative relations between morphological and kinematic parameters and predicts phenomena, which can be compared with observations. Using Fabry-Perot optical interferometers, including GHaFaS on the William Herschel Telescope, and observing a sample of over a hundred nearby galaxies, astronomers have discovered that there are more density waves than predicted by theory, and that there are relations between them forming a complex pattern of resonances, which orchestrate the “Music of the Galaxies”. For any galaxy with spiral arms, current theory describes the existence of a density wave and its resonances. For these galaxies the theory predicted two sets of waves, one in the inner part of the galaxy containing the bar, and the other in the outer part containing the spiral arms. In their study, however, the astronomers found to their surprise more than two circular zones of density waves in almost all the galaxies analysed. The most frequently found number was four, although the maximum was seven. Some of the observable phenomena the theory predicts include the Inner Lindblad Resonance (ILR) and Outer Lindblad Resonance (OLR), and the co-rotation radius, a key parameter which is defined as the radial position where the angular frequency of the gravitational perturbation propagating in the disc, usually called the pattern speed, is equal to the angular speed of the matter which is following circular orbits. Astronomers developed a new method, the Phase-Reversal Method, to determine the resonance radii of a disc galaxy. The prime material for the method is the 2D residual, or non-circular, velocity field, which is obtained by subtracting off the rotation curve model from the initial velocity map, which is derived from the data cube. They then look for the radii in the galactic plane at which these residual velocities change their phase along the radial direction, from inflow to outflow, or vice-versa. A plot, against galactocentric radius, of the number of pixels across which the phase changes occurs, shows a set of well defined peaks which give the resonance radii. Panel a: Line-of-sight velocity field in Hydrogen-alpha for NGC4303 (color table to the right gives values of the velocity in km/s). Panel b: Rotation curve extracted from the velocity map of panel a. Panel c: Velocity model map generated by rotating and projecting the rotation curve. Panel d: Residual velocity map derived by subtracting the model map (panel c) from the velocity map (panel a). Panel e: Radial distribution of phase reversals. Vertical solid lines mark the resonance radii and horizontal lines near the top indicate the uncertainty bar associated with each radius [ JPEG | TIFF ]. "IAC astronomers discover 'The Music of the Galaxies'". IAC Press Release, 18th December 2013. Font, J., Beckman, J. E., Querejeta, M., Epinat, E., James, P. A., Blasco-Herrera, J., Erroz-Ferrer, S. and Pérez, I., 2014, “Interlocking resonance pattern in galaxy disks”, ApJS, 210, 2. Paper. Font, J., Beckman, J.E., Epinat, B., Fathi, K., Gutiérrez, L., Hernández, O., 2011, “Resonant Structure in the Disks of Spiral Galaxies, Using Phase Reversals in Streaming Motions from Two-dimensional H-alpha Fabry-Perot Spectroscopy”, ApJ, 741, L14. Paper.